Are you looking for a new career? Are you are a Canadian citizen or a resident of Canada, a student of Christian Science, and a member of The Mother Church? 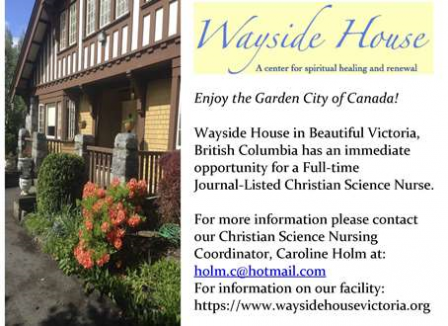 Are you interested in Christian Science nursing as a career? Would you like to relocate to beautiful Victoria, B.C. and enjoy our temperate mild climate? If so, we would love to hear from you! Come and join us at Wayside House. We offer a competitive wage with benefits, including a pension plan. We can also help you with relocation costs. Residents of Canada are eligible for financial assistance for training from Trust Canada.